Vertical blinds are probably one of the most underrated window dressings there are. People tend to look past all their wonderful aspects, and that is exactly why we want to tell you more about the advantages of choosing vertical blinds for your home. Of course you could be thinking that all window treatments serve the same purpose, and as much as they do, they all do it in a different way. There are different reasons for choosing different blinds, curtains and shutters. It all depends on the interior design of your home and of course also what type of windows or doors you have. For now, let’s focus on the reasons behind why choosing vertical blinds for your home is a good idea. Unlike curtains that are made out of fabric, vertical blinds can easily be kept clean. Due to the vertical design instead of horizontal, it takes a much longer time for any dust to build up on them. Once they are looking a bit dusty, all you need to do is dust them down with a duster or simply wipe them down with a clean cloth. It is also not necessary to take them down, the cleaning can be done while they are still hanging in place. That’s right! When that summer sun is beaming down in your house, you no longer have to turn to your aircon first. Avoid an overheating room by simply controlling the amount of light and rays that enter the room. A dark room already feels a lot cooler than one filled with light. Besides cooling down, you will also be saving a lot of money on your electricity bill if the aircon isn’t blasting full speed anymore. Just as they can help cool down your house in summer, they can also prevent heat from seeping through microscopic cracks in your windows in winter time. Besides that, they also help prevent those cold drafts from sending chills up your spine as they create a nice and cozy environment for you to enjoy. As mentioned above about saving electrical bills, they can do so in the cold months too as you won’t need to put the heater on all the time. SO, basically, vertical blinds can help you save money all year round! This can make the area feel a lot more spacious and open which is perfect for homes that have a low ceiling. What’s even better is that they work great with sliding doors and big windows! This means it can be used in almost every room of your house. Due to the vanes in these blinds, you will still be able to see the view on the outside unlike with curtains where it covers up everything from top to bottom. You can sit back and enjoy your privacy and dimmed light without feeling totally caged from the outside world. With some window dressings there is always some sort of stress such as the cords of horizontal blinds that need to be handled with care and caution. 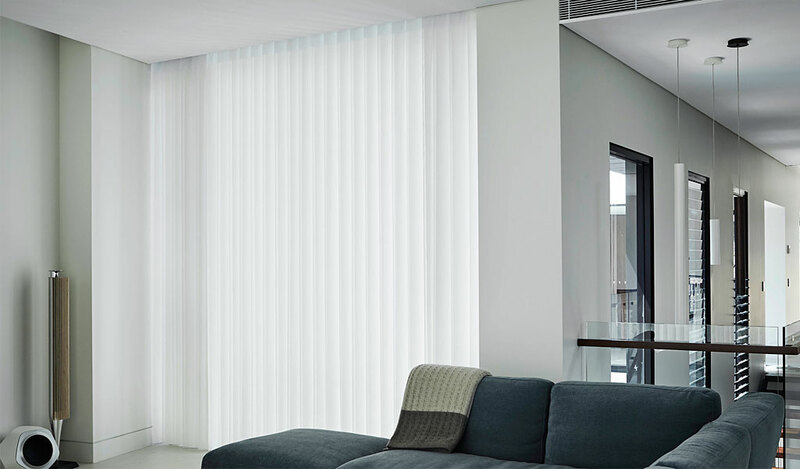 We’re not saying you can be rough and careless with vertical blinds, but thanks to their amazing design, they are much easier to operate than most. They simply hang from a headrail, move along a rack and can be controlled by tilting them from side to side in order to manage the amount of light that’s coming through. Now that you are more aware of only SOME of the advantages of choosing vertical blinds for your home, we hope to be hearing from you soon. You are more than welcome to ask us any questions regarding our vertical blinds and we will get back to you soonest with the needed information.